Last weekend all three of our boys had the opportunity to be campers with their Dad. Two of them are too young to be summer campers and so this was a big deal. Chris Weedin aka VanHelsing, was the speaker and he led a “Raising A Modern Day Knight” weekend here at camp for boys and dads. Our boys were ecstatic. They got to sleep over at camp, sword fight with Choco, fight The Dark Knight with their Daddy, and build forts and have Nerf gun wars with Odysseus (one of our camp counselors) and Choco (our maintenance director) while the dads were in session. While all the boys were wrestling/Nerf warring/fort building, all the dad’s watched the “Raising a Modern Day Knight” video sessions and had discussions about fatherhood. 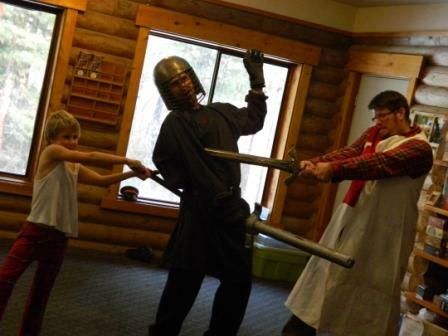 Then they finished the weekend off with a knighthood ceremony with their boys (using a real sword) and getting to fight the “Black Knight” together as a team. Scruffy (our director/my husband) brought home three exhausted but happy boys when the weekend was over. Thank you Chris, Scruffy, Choco, Odysseus, and Sweet Tea for making this wonderful camp happen. The boys had a blast and so did their daddy. So, I was running around all crazy the other day. I had to drive down off the mountain to pick up my oldest boy from a birthday party and get a bunch of vanilla icecream for camp, but first I needed to pick-up a dishwasher for the weekend. One of our C.I.T.’s (counselor in training) had traded dishwashing time for the chance to come up as a camper to CamasCon and so Scruffy cashed in her I.O.U. and sent me to Tumble’s house to pick her up. As we wandered through the dark countryside, missing the right driveway and doing sudden U-turns into small country roads, we started talking about camp. At one point she told me that she had become a completely different person since camp. “What do you mean?” I asked. And then she told me a story I have heard before. She was at that place. The watershed. That point where a Christian kid looks back and sees their childhood faith, looks forward and sees adulthood approaching, and wonders what they are going to do with God once they have stepped out on their journey alone. Was God just some lovely myth from her parents, passed down through her family to land in her lap? She came to camp as a C.I.T.. We hounded her, we trained her, we made her work and struggle and didn’t give her much time to sleep. And we loved her. The girl that I drove up to the camp kitchen that night was confident. She knew who she was and she knew her Lord. “What about camp was so significant to you?” I asked. So, I wanted to tell you good job. Sometimes camp does not run smoothly, everything is all crazy, equipment is breaking down, and you wonder if you’re ever going to get it right. Well, you did Camas Staff of 2013. You remembered to love. My husband is giving his testimony at CamasCon this morning. As I was praying for him I realized that it is easy to despise the quiet works of God. Things like a long phone call on a rainy day, holding a crying baby so your neighbor can take a shower, or a weekend of boardgaming with friends who love God. It was not a mighty sermon that won my husband over to God. It was not a fierce and determined missionary or someone stopping him on the street and handing him a tract. No, Scruffy was edged closer and closer to the kingdom of God by quiet acts of love. A believing friend stopping by to borrow chewing tobacco, Christian friends asking him to join a game of football, and spending hours upon hours playing video games with a young man who eventually shared his testimony. Simple, even ignoble things. All used for the glory of God. So, do not despise the quiet works of the LORD. Do not despair. God is at work. If we set these things before Him. If we accomplish tasks with His love and an eye upon His kingdom. God can use that. He is the master of using the simple things of this world to accomplish mighty works. That can be you my friend, and that can be me. This week at Camas Meadows Bible Camp that means CamasCon. Playing games all night, creating a place where no one is going to yell and throw game bits when they lose, eating lots of snacks and drinking too much coffee. Hearing Scruffy talk about his ragged journey toward a God who dared to rescue the sinners and the sacrilegious. Simple things, done with love. But Scruffy knows not to despise them, for that is how the God of all wisdom finally captured his heart.